You ever heard of Wi-Vi? 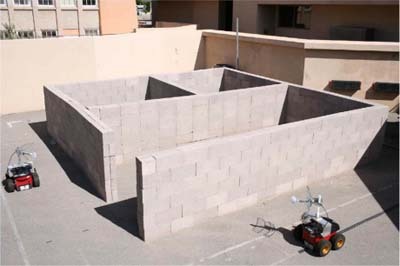 Wi-Vi is a technology used in robots created by University of California, Santa Barbara, to see through walls using only Wi-Fi signals. Robots work in pairs, walking the perimeter of an object or structure, alternating between transmitting and receiving Wi-Fi signals through the object being scanned. By the difference between transmitted and received signals, they can detect the presence of hidden objects, managing to define its contour and if they are made of metal, wood or flesh. It isn't the first time this type of technology makes it possible to see through concrete with Wi-Fi signals. MIT (Massachusetts Institute of Technology) had already achieved it with a system using fixed Wi-Fi antennas to detect movement behind walls, but resolution was too low to detect and identify static objects. Even with this new system, images obtained still don't have a good resolution, but they are evolving for this. Main focuses for this technology are security business, archaeological research and search and rescue in emergency situations (landslides, floods, etc. ).